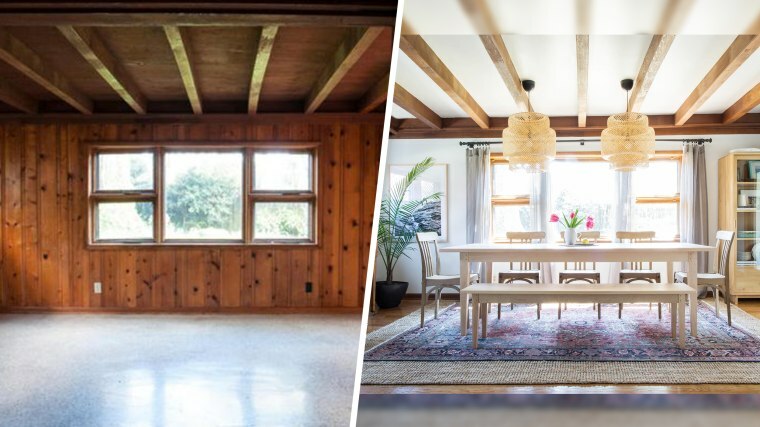 This former garage in a 1940s Tudor home was transformed into a gorgeous dining room fit for the entire family. Believe it or not, this garage was built in the 1940s. Now, it's unrecognizable as a gorgeous dining room after a major makeover. Adam and Amber Ford of the blog The Happy Tudor moved into this gorgeous home in Knoxville, Tennessee, and immediately set about transforming the space to be more in line with their personal style. While they've worked on renovating multiple rooms in their home, the dining room (which was once a garage) may have received the biggest overhaul. "This room is surrounded by windows looking out to our backyard, which has English-cottage-type landscaping, and it leads out to our screened-in porch," Amber Ford told TODAY Home. "Because of this, we really wanted this room to feel like a continuation of the outdoors." Ford opted for colors that would make the room feel light and bright, and added textured layers throughout the space. "While we wanted the room to have a level of formality, we also really wanted it to be comfortable and approachable," said Ford. "By adding in textured layers — rugs, curtains, lighting, art, plants and timeless furniture — we brought the blank space to life." Since the room wasn't originally configured for entertaining, the Fords had to start from scratch by adding in sheet rock and wood flooring. Their goal was to create a space that integrated seamlessly into the rest of their home. "Because this room is not original, making it have character and feel cohesive with the rest of the house was our biggest challenge," said Ford. "We painted the ceiling between the beams to make them pop, carried in hardwood, added lighting and brought in quality furniture to help us tackle this challenge." The couple took their time in accumulating furniture that would make the space feel complete. "Our first priority was to invest in the bones of the space," said Ford. "From there, we knew we really wanted to invest in the furniture — as we were able, we slowly added in those pieces." While the light wall color and windows have made the biggest impact, the furniture also helps make the space feel large and open. Ford says her favorite piece is the table. "The table is a favorite element in the room, and honestly, in the whole house," said Ford. "We've loved our time spent around the table and can't wait to create even more memories around it."